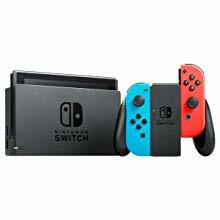 Nintendo Switch is a breakthrough home video game console. It not only connects to a TV at home, but it also instantly transforms into an on-the-go handheld using its 6.2-inch screen. For the first time, players can enjoy a full home-console experience anytime, anywhere. 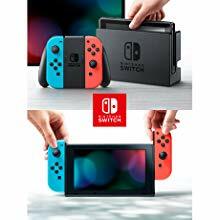 This console comes with Neon Blue/Neon Red Joy-Con Controllers. Nintendo Switch also contains a number of built-in features that make it more interactive. 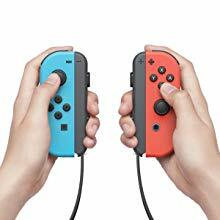 The left Joy-Con has a Capture Button that players can press to take instant screenshots of game play to share with friends on social media. 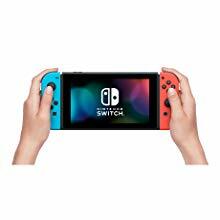 The right Joy-Con includes an NFC touch point for interaction with amiibo figures, as well as an IR Motion Camera that can detect the distance, shape and motion of nearby objects in specially designed games. For example, it can tell how far away a player’s hand is, and even if the hand is forming a rock, paper or scissors shape. Nintendo Switch makes it easy for players to stay connected. Up to 8 consoles can be connected for local wireless play.